Though the Habsburg Monarchy or Austrian Empire (known as the Austro-Hungarian Empire or the Dual Monarchy after the constitutional reforms of 1867) was never a major sea power, it had since the eighteenth century maintained a small but efficient navy. In 1866 the Austrian battle fleet under the command of Rear-Admiral Tegetthoff won a notable victory over the Italian Navy at Lissa in the Adriatic, but thereafter lack of funds stifled the development of Austrian naval power. 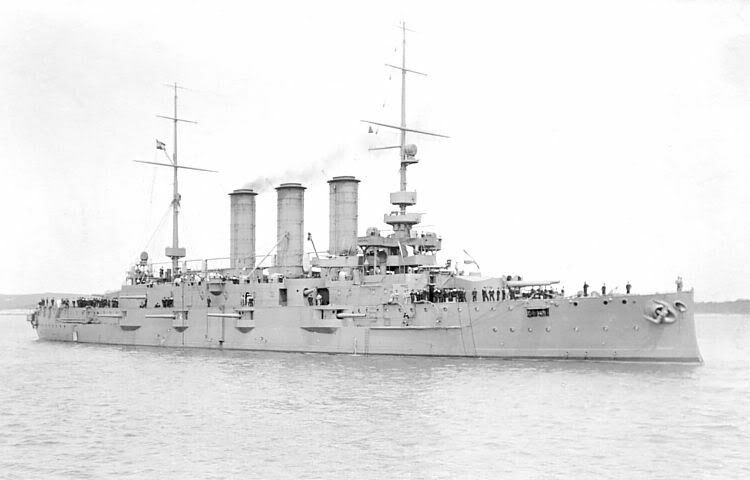 In 1895, however, a major modernization program was approved and by 1914 the Austrian fleet was a modern force. Its most powerful units were the three pre-dreadnought battleships of the "Radetzky" class and the dreadnought battleships of the "Tegetthoff" class (two in service, one preparing to commission and one nearing completion). The capital ships were backed up by a small force of light cruisers, destroyers and torpedo boats. Austria-Hungary's main fleet base was at Pola on the southern tip of Istria, almost directly across the Adriatic from Venice. Though the battleships saw little action during World War I, the fleet's light forces fought many engagements with the Italian Navy. When the Dual Monarchy collapsed in 1918, the ships of its navy were allocated to the victorious Entente powers. For most of the eighteenth century, variants of the black-yellow Reichfarben flag displaying the double-headed black eagle served as the Austrian war ensign and admirals' rank flag. Commanders of squadrons flew a swallowtailed pennant, horizontally divided black and yellow. In 1786 a new naval ensign was introduced: a banner of the red-white-red Austrian arms charged with the crowned state arms. It was similar to the state flag adopted at the same time but with the arms offset toward the hoist rather than centered. The same flag, with different proportions, was used as the naval jack. A new broad pennant for commodores, based on the 1786 ensign, was adopted at the same time. Up to 1828 the ensign was also the rank flag for admirals, exact rank being denoted by the mast from which it was flown: at the main by admirals, at the fore by vice-admirals and at the mizzen by rear-admirals. In 1828, a square version of the ensign was adopted as the admirals' rank flag. As before, it was flown from different masts depending on rank. In 1853, two new flags were introduced for admirals. The rank of Großadmiral (Fleet Admiral) was denoted by a square red-white-red flag with a border of black and yellow triangles, charged with the crowned state arms, flown at the main. All other admirals flew a slightly rectangular red-white-red flag, charged with the crowned arms and bearing a small black-yellow-black canton. Once again, exact rank was denoted by the mast from which the flag was flown. In 1874 the rank of Großadmiral fell into abeyance, and the flag for this rank became the flag for all admirals, replacing the 1853 design. With the demise of the wooden capital ship, the practice of flying the same flag from different masts to denote rank was no longer practical, so in 1894 new admirals' rank flags were introduced. They were similar to the 1874 admirals' flag, but slightly rectangular and with stars added according to rank. The rank of Großadmiral was still in abeyance, so no new Fleet Admiral flag was introduced at this time. Finally, in 1915 a new naval ensign and jack were adopted, displaying the crowned Austrian and Hungarian arms side by side. New rank flags were also introduced, with horizontal red-white-red stripes, three six-pointed stars and a wreath for the rank of Großadmiral, and stars only according to rank for other admirals. On the commodore's broad pennant, a star replaced the crowned arms. It is unlikely that either the 1915 ensign and jack or the 1915 rank flags were much used before the war (and the Habsburg Monarchy) came to an end in 1918. Flag Proportions: Early Austrian naval ensigns varied in their proportions. The 1786 and 1915 ensigns had 2:3 proportions, while the corresponding jacks had 4:5 proportions. Rank flags were made square or slightly rectangular except for the commodore's broad pennant, which was approximately 3:8. SMS Erzherzog Karl, a pre-dreadnought battleship of the Austro-Hungarian Imperial and Royal Navy, as she appeared just before the outbreak of the First World War. The name ship of a three-unit class, Erzherzog Karl joined the fleet in 1906. Though well designed she and her sisters were quite outclassed by the all-big-gun battleships of which the first, the Royal Navy's HMS Dreadnought, was also commissioned in 1906. With an armament of four 9.4-inch and twelve 7.5-inch guns the "Erzherzogs" were comparable to large armored cruisers, though slower and better protected. During the war they formed the III Division of the battle fleet at Pola, taking part in a number of bombardments and other operations against the Italian Navy in the Adriatic Sea. At the end of the war all three were taken over by the new state of Yugoslavia but Erzherzog Karl was eventually ceded to France and there she was scrapped in 1921. In this photograph the Austro-Hungarian naval ensign is hoisted at the second mast.